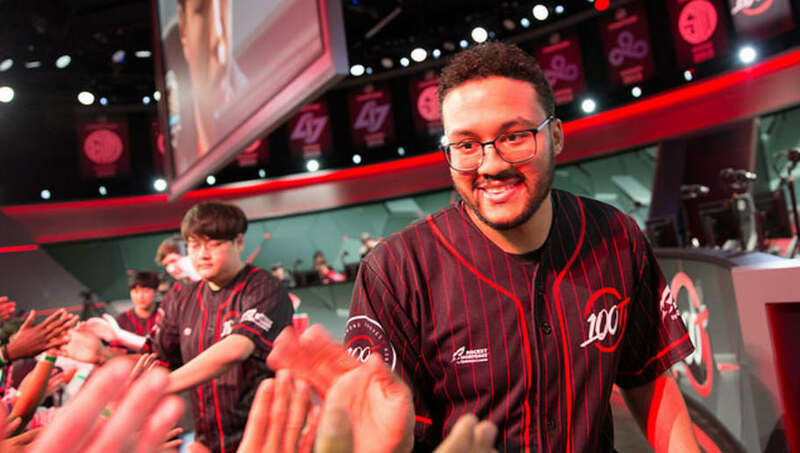 Zaqueri "aphromoo" Black and ​100 Thieves came out on top in a close match against Clutch Gaming, and are now 4-1 in Week 3 of the NA LCS Spring Split. We caught up with aphromoo to get his thoughts on the new team, establishing a legacy with a new organization and his new teammates. Nathan Fusco: You leave CLG, you join 100 Thieves. What was it like leaving an established org to a brand new one? Zaqueri "aphromoo" Black: It sucked, of course. I felt the most bad because I was leaving my friends and all the people that mattered to me the most, relationships I made and stuff like that. Coming into 100 Thieves, Nadeshot was the guy I talked to the most, very accommodating. Definitely made sure I was comfortable and felt good about joining their org. Meeting all the staff, management, coaches and players, just felt very welcome. I knew that’s where I wanted to go based on how off-season went and talking to all the team. NF: Is there a desire on this team to establish a legacy, just like you have on Cloud9, CLG all the top teams? Especially with you as an in-game leader and shot-caller, you can be that presence on the team. Is that exciting for you? Aphromoo: One of my goals right now is definitely to put 100 Thieves on the map. In terms of establishing themselves as an org, I think that comes with the goal. Only thing I really look out for is we have to put in the hard work to get there. Building up the team relationship, bonds, how we execute. Coming into a new team shot-calling isn’t always designated as a person, it’s built organically, maybe it’s me, maybe it’s not. All that just takes a lot of time and most orgs can’t really get it from their first year but I think we can. NF: You’ve had Zikz for quite a while now. What’s it like having pr0lly? Aphromoo: Zikz will always be one of the boys. Pr0lly, very cool, very patient, always listens a lot, he [has] a calm demeanor, never really yells or anything like that. Makes you feel like you have a chance to talk, I think those are good qualities in a coach. Definitely sparks a lot of creativity from our players. NF: You've had quite different selection of players to play with. You’ve had Doublelift, you’ve had Stixxay, now you have Cody. Kind of in a way like a Stixxay, a younger player that you can morph and mold. How has it been playing with him so far? Aphromoo: With Cody, it's been fun. Feels like he’s still kind of a rookie. Even though he had his first split on IMT, he’s coming over to 100 Thieves and only played for two splits. Definitely a good kid, really wants to learn a lot and listens to all his teammates, in terms of them giving their opinion. He always wants to have constructive criticism, so he’ll always ask me, what should he do, what I think, what he thinks. I think that’s good to have in a player, it’s really hard to find nowadays since that type of quality is overlooked when you pick up new players. Cody’s going to do well, just got to help him out and grow, in the way that he wants to grow so that he makes even less mistakes and is able to show what he can do. NF: You have an excellent eye for talent. Who on your roster is either not getting enough love right now or people are not paying attention to him? Someone that’s going to surprise people down the road. Aphromoo: I think almost all the players right now. I don’t think were playing too well but we’re doing decent. Not everyone gets to shine when we’re playing these games, so I feel kind of bad and want to help other players be able to perform to the level they want to play. Don’t care too much about myself, but Cody’s going to do really well when we come up to the end of the season, playoffs and stuff like that. I’ll make sure of it. I think Meteos is doing really well but it's hard to see because he has a lot of intangibles that you don’t see. His communication, how he thinks strategically about the game, making sure we’re focused, stuff like that.